then you can follow these instructions to configure your router manually to allow other JamKazam clients to send network traffic in to your network. 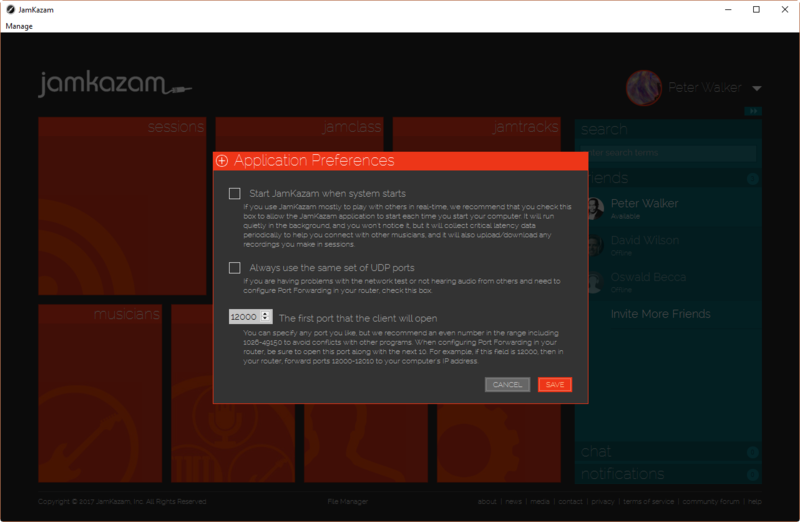 You will also need to configure the JamKazam application to use two specific UDP ports. We'll start by configuring JamKazam, and then move on to the router. By default, JamKazam uses a range of dynamically chosen ports, which just means on every music session, JamKazam will use different port numbers. 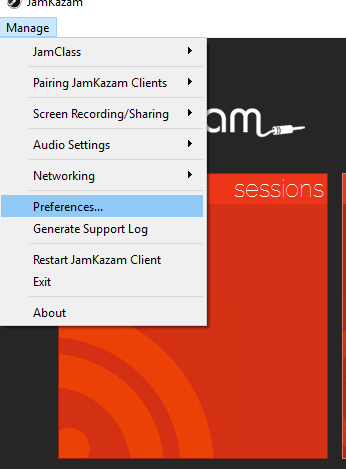 You will need to configure JamKazam to instead use the same port numbers for every music session. To do this, from the JamKazam menu select Preferences. Once the configs are in, you can then start JamKazam back up, and we can move on to configuring your router. Configure your router to allow port numbers 12000 to 12010 into the computer running JamKazam. Also make sure you indicate UDP, which is usually in a dropdown. Note: Routers call sending traffic into a computer from a particular port Port Triggering and/or Port Forwarding. So, look for Port Triggering or Port Forwarding in your router's configuration interface; it's sometimes underneath a section called Security or NAT. If you are unsure about how to proceed on this step, search the internet for the model number of your router, and also put in the word 'user manual'. The user manual will also help you get into your router's configuration interface, which often times the hardest thing to figure out when unfamiliar with configuring routers. Once the ports are open, start the JamKazam application. To validate that your configs worked, try the Network Test. You can do quickly by going to your name it the top-right of the interface, and select ‘Test Network’ in the dropdown that shows on a mouse hover.